Look for Less: Valentino Rockstud Sandals. I am pleased to announce that Target has the Betseyville studded sandals back in stock!! They are the best Rockstud lookalikes I’ve ever seen. If you follow my Instagram, you already know I own rock studs and rock stud lookalikes and am obsessed with them all equally. If you can afford the splurge valentino version, great. If not, the budget friendly Betseyville version is the shoe for you. I’ve had the black ones for a while and love them and just ordered the tan online. Can’t wait to rock them all Summer long. Betseyville Studded Gladiator Sandals $33 available at Target. Every wardrobe needs at least one mustard item, whether it be a sweater, dress, bag or a heel. Mustard is wearable year round and is complimentary to many colors. 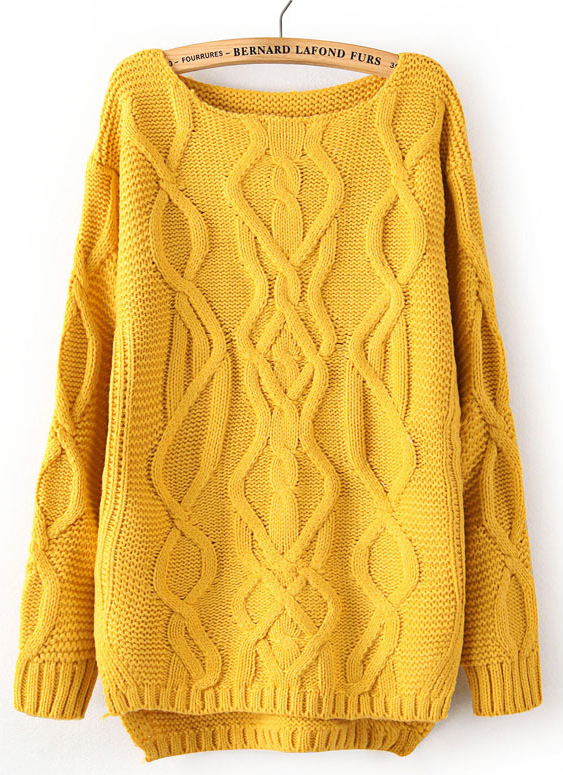 Check out this oversized cable knit sweater in the golden shade at a perfect price! I can already picture wearing this sweater with leggings, skinny jeans or a body con skirt. How will you wear it? Mustard Sweater $32.95 Let me add that the sweater is a “one size fits most” so if you wear a small, it will fit very loose. If you wear a large, it will fit smaller. If you wear a medium you should be golden!!!!! Happy Friday fashionistas!!!! I hope you all enjoying your week thus far. Here are some great finds for you to shop and nothing is over $20 as usual! 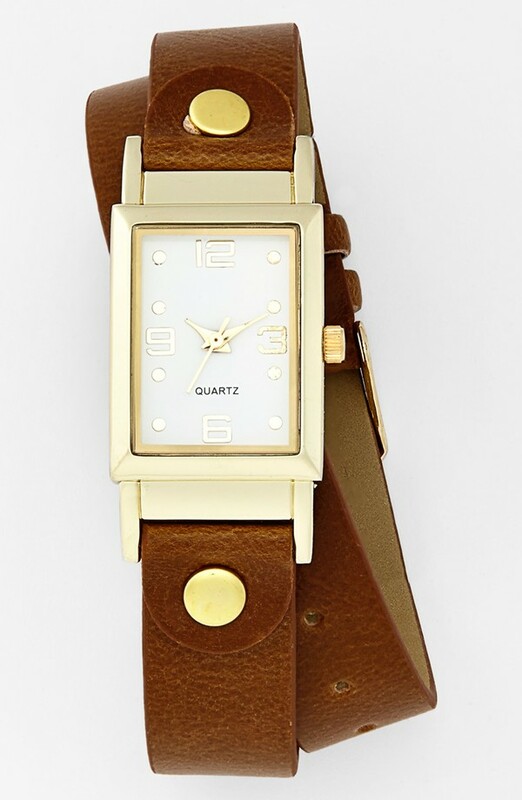 I found this super cute watch at Nordstrom about a year ago- I featured it on this blog and it quickly sold out. The great news is… it’s BACK IN STOCK now. 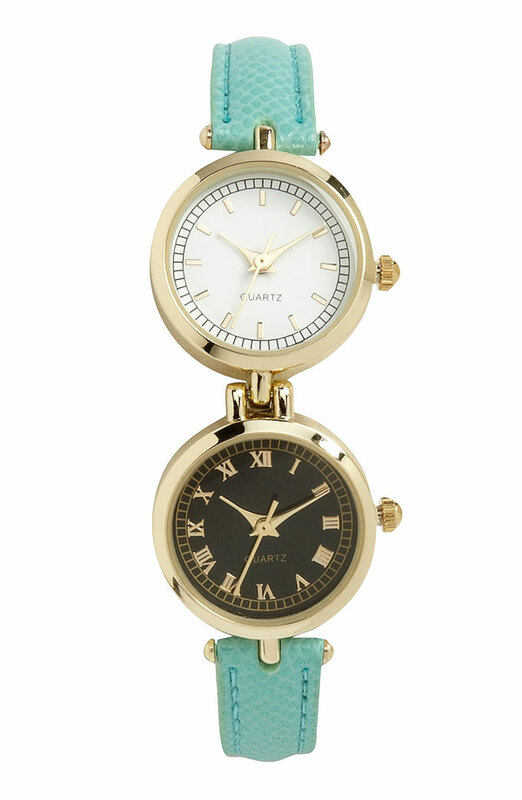 Two Faced Watch $20. I am a huge fan of wrap watches and this one is perfectly priced for all to enjoy! Wrap Watch $20. 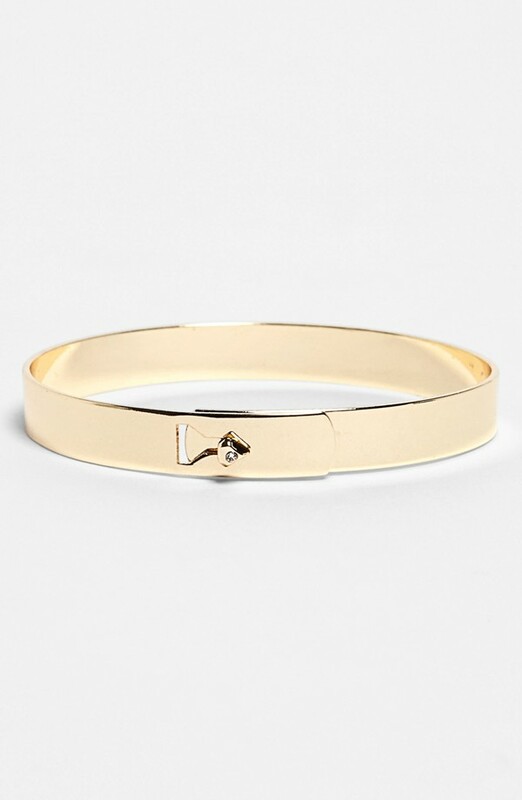 This clasp bangle is so cute and has a delicate, yet industrial feel to it. I love the tiny rhinestone on the clasp as well the fact that it looks like I spent much more than $10 on it! Looks great alone or stacked! I wore mine alone today! Clasp Bangle $10 Available in gold tone or silver tone. 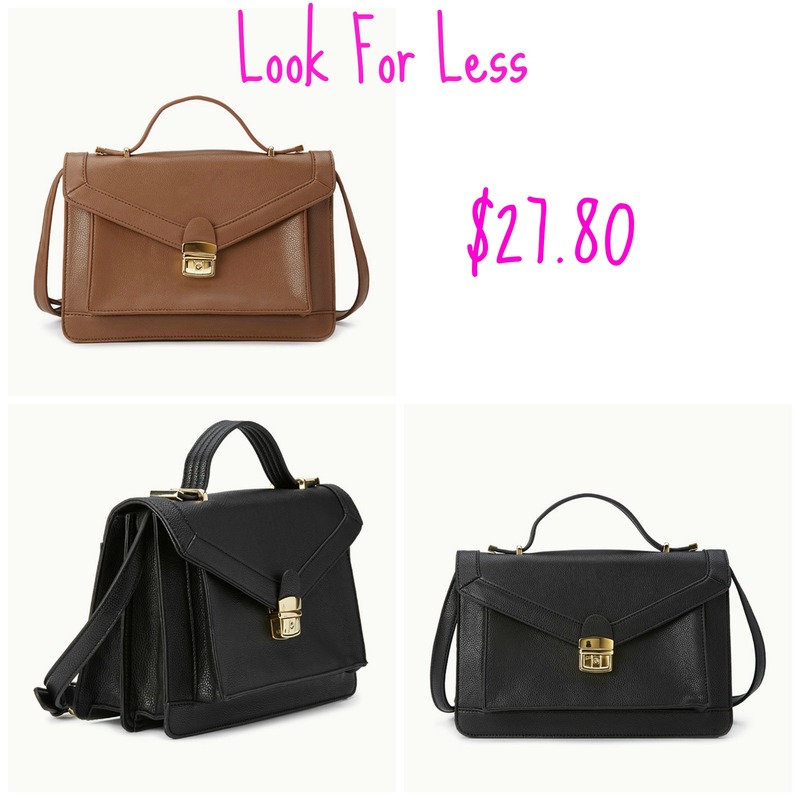 Look For Less! Loeffler Randall Rider Bag! 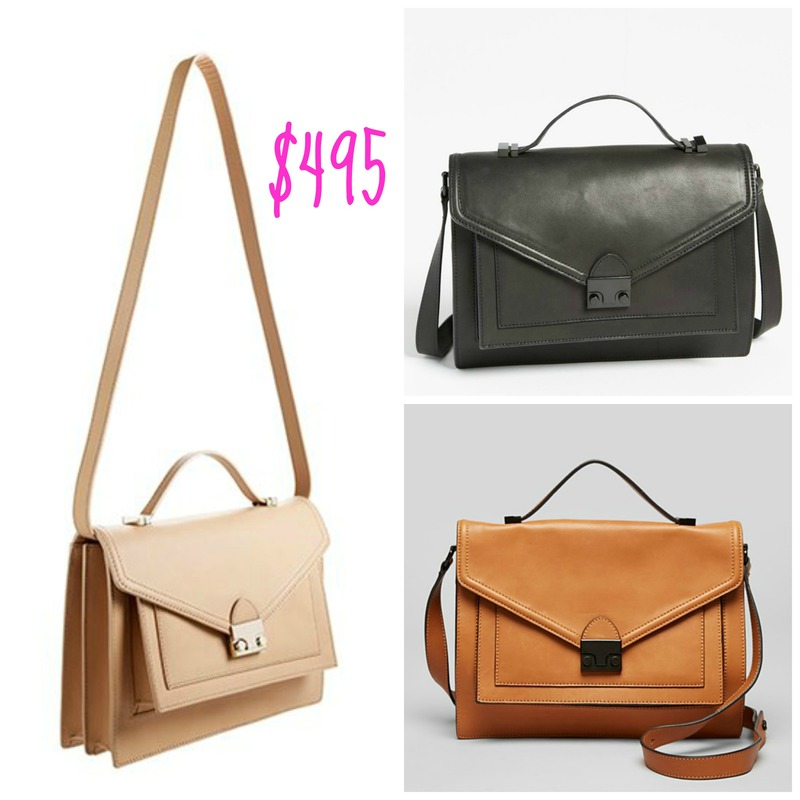 Loeffler Randall makes beautiful bags! Their Rider bag ( a bag that has straps on its backside to hook onto a bicycle) is coveted by bloggers and bag lovers around the world. I featured the floral Rider bag on my Instagram last week and got so many questions regarding it, leading me to this post today. The rider bag retails for $495 and up, which leaves out a lot of fashionable ladies who can’t squeeze it into their budgets. Buuuuuuuuut-Have no fear, if you’re a fashionista on a budget, you can have a very similarly stylish bag for only $27.80!!!!! 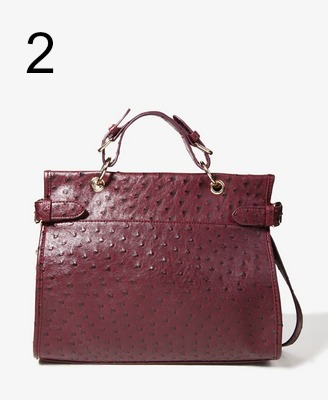 Loeffler Randall Rider Bag available at Zappos Couture. Top handle bag available at Forever 21. Burgundy..oxblood..maroon..deep red..bordeaux..berry..wine…….. This Fall these rich reds are HUGE! 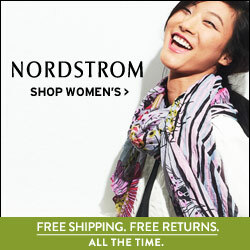 These colors look great on many skin tones and are wearable well into Winter. Here are plenty of affordable choices, including plus sizes. 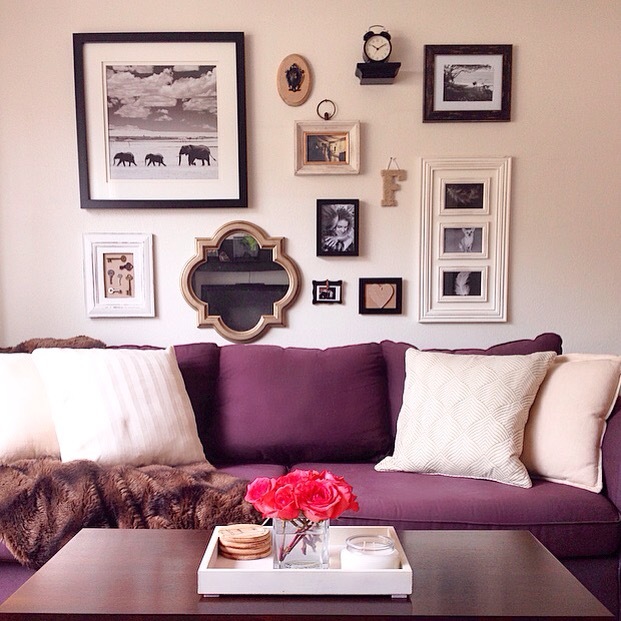 Complimentary colors: Burgundy looks great with black, green, blue and grey. 1. Button up embroidered top($24.80) 2. 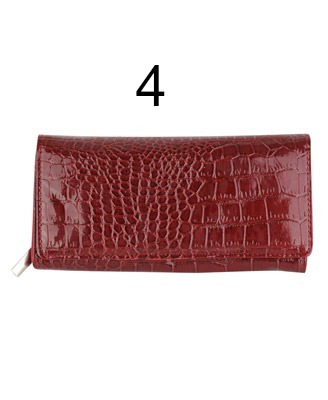 Faux ostrich satchel($32.80) 3.Plus size single button jacket($29.80) 4.Faux croc wallet($9.50) 5. Lace dress($24.80) all available at Forever21. 6.Belt($5.80) 7. Zippered cross body bag($24.80) 8. Lace up wedge bootie($32.80) all available at Forever21. 9.Layered dress($24.80) 10. Plus size jeans($24.80) 11. 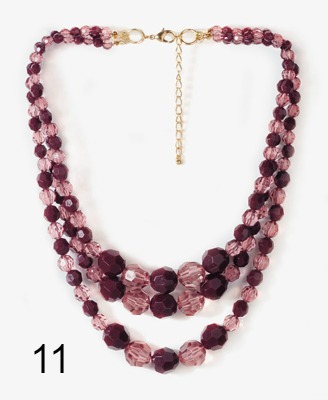 Necklace($8.80) 12. Button back tank dress($17.80) all available at Forever21. 13.Peplum dress with belt($22.80) 14. 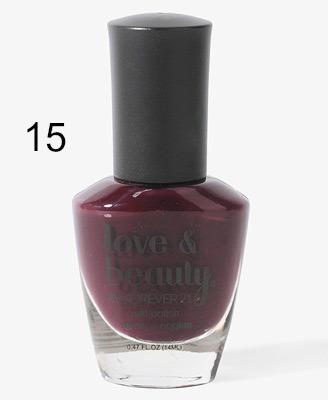 Top($17.80) 15. Polish in wine ($2.80) 16. Plus size top with strap detail($24.80) 17. 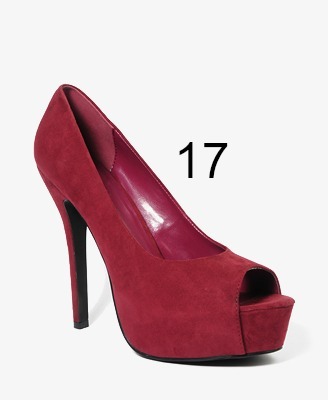 Faux suede peep toe heel ($26.80) all available at Forever21. 18. 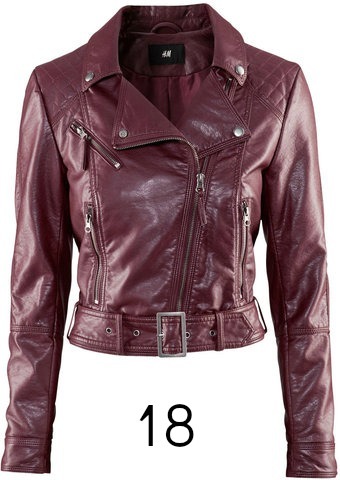 Faux leather jacket($49) 19. Fur trim jacket($69.95) 20. 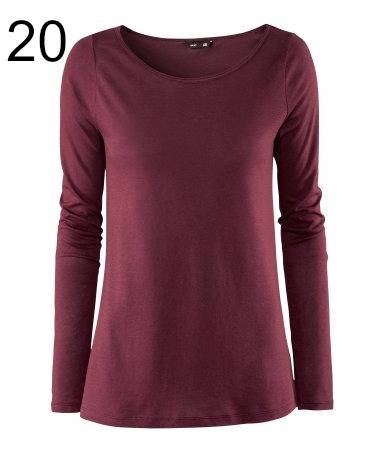 Long sleeve top($12.95) all available at H&M stores.